With the sale of my Azzurri Road bike and my Dahon folding bike (yes I was very sad to be listing them), there was more than enough cash to put towards a new mountain bike. After completing the Tour de Hills on April 1st, 2012, I really wished I had taken a mountain bike with front shocks instead for it. Those bumpy roads were a killer. I really like road bike riding but I am also also finding that I prefer the more upright riding position for a geared bike. Not that fussed about speed anymore. I would like to get into more trail riding and heading out with a few groups/clubs as well as ride on the road here and there. A decent mountain bike will allow me to do all that. Even if I don't mountain bike off road for awhile and stick to roads, I can always put slicks on the bike for sealed roads. I will still be using my Repco single speed bike for my daily commute to work and some occassional night riding around my local area. 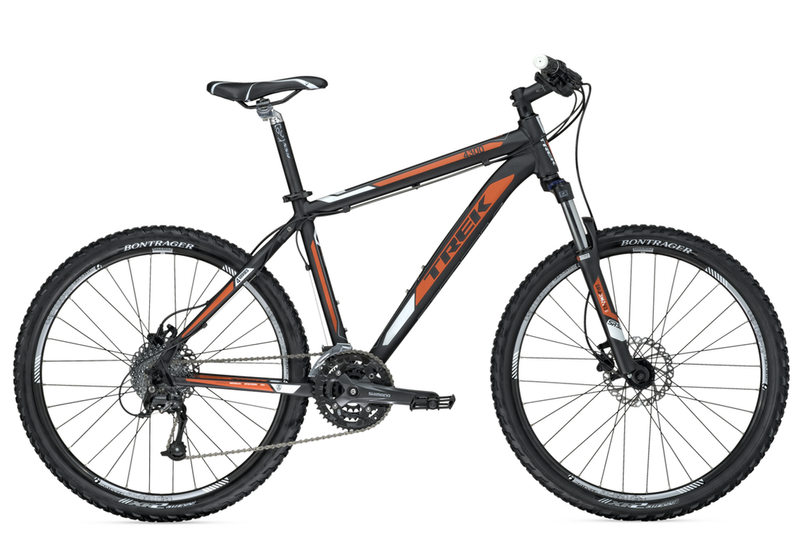 Since listing my bikes on the web, I have been doing alot of research on various mountain bikes looking at brands, components, sizing, and price. Also spoke to a couple of bike shops on the phone. Even checked out second hand bikes (hardly used). 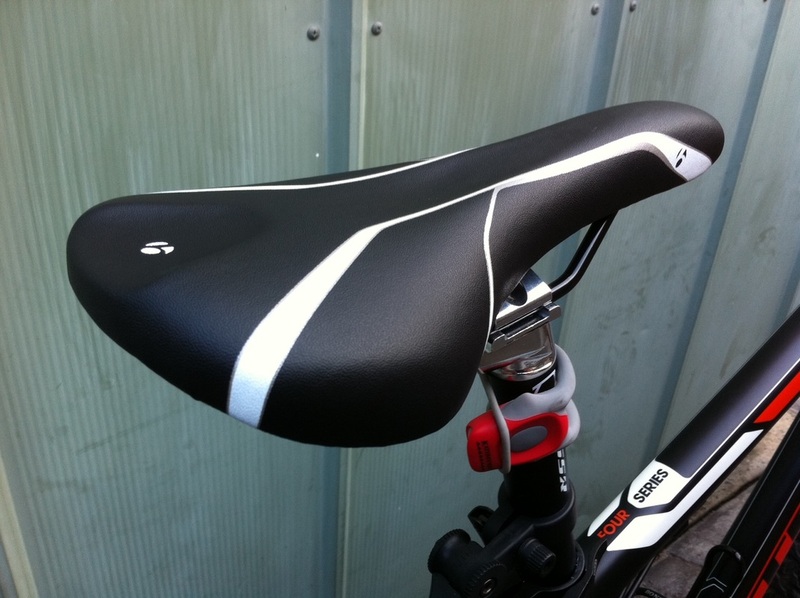 When my mate was looking for a new bike and ended up buying his Giant Upland SE (see the Roadmaster Trailmate section of my site), we headed out to a few bike shops and I asked alot of questions too. I hadn't bought a bike new from a shop since I bought my road bike 7 years ago. What I found out was that basically the more you spend the better quality they are. Saying that though, the web is a wealth of information, but nothing beats going into the bike shop and sizing yourself up for the bike that you want. 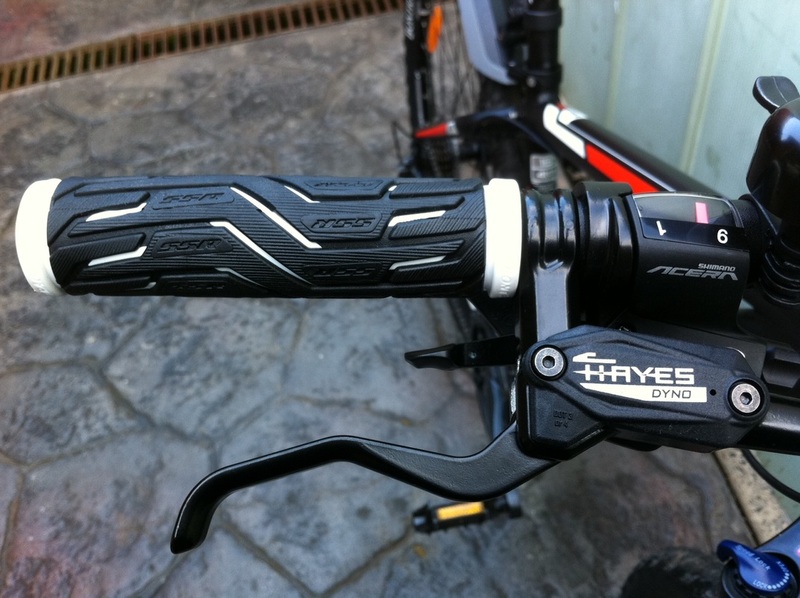 Every bike, road/mtb/hybrid is built different. Manufacturers do not all adhere to a general sizing rule and do whatever they like to make their bikes more unique than others. For example I came across two bikes. One from GT and the other from Trek both were 29er's (29" wheeled mtb's) which were the same size and almost the same components but one had a 27.2mm seat post and the other had a 31.6mm seat post! 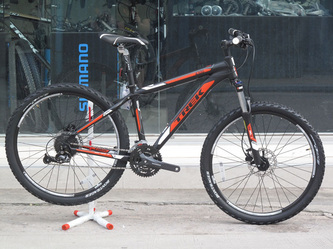 My requirements were for a bike that was able to go off road more but also still handle the road when required. 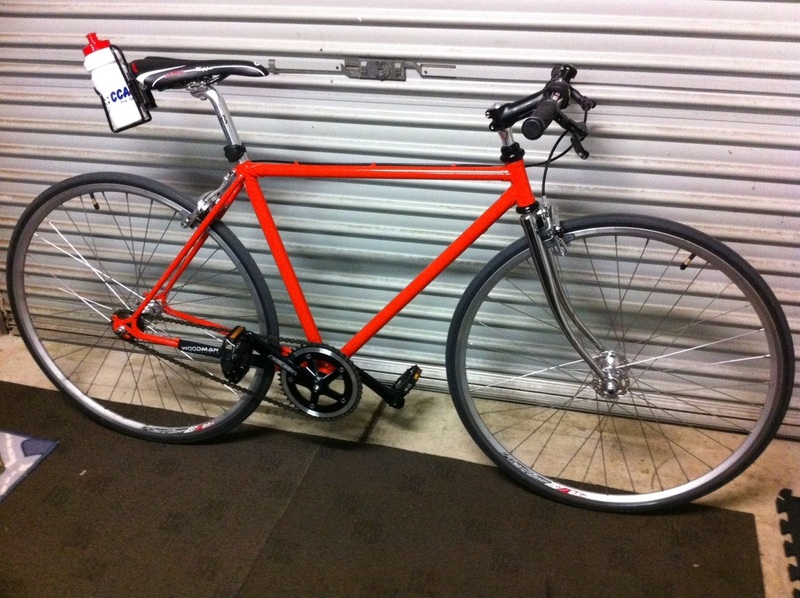 Reason being is that I already have a road bike, my Repco single speed. I'll never get rid of that one! I also wanted something that wouldn't break the bank but was decent enough quality. With equipment, I was looking for hydraulic brakes, front shocks, a decent brand with a decent warranty with proven experience and durability. 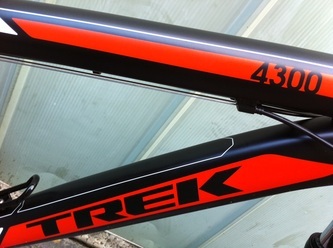 In the end I always came back to the Trek 4300. It answered all the questions and also looked the best. Only one colour was available for that model but luckily I liked the colour scheme. I went into the Trek Store at Rouse Hill and they sized me up. 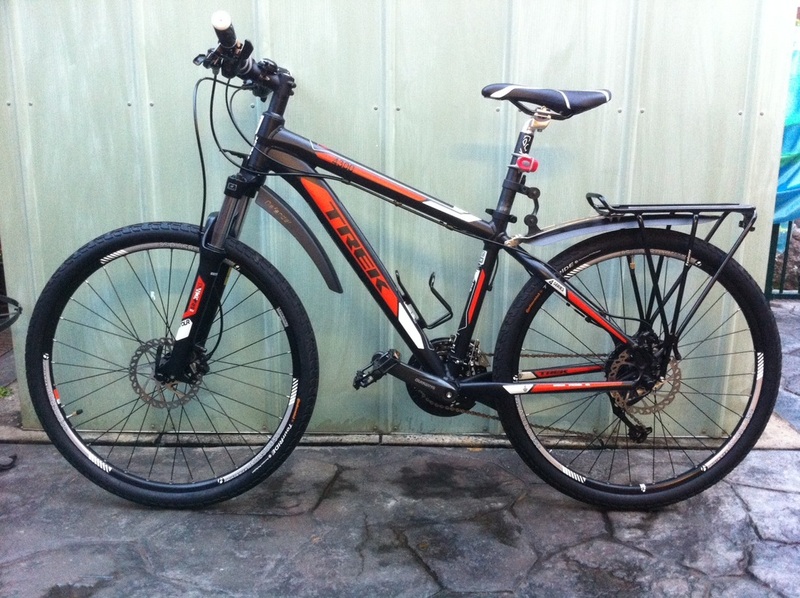 Ended up going for the 16" framed, 26" wheeled model which fitted me prefectly. I rode it around the carpark and absolutely loved it. Was super smooth even on the knobbly tyres. 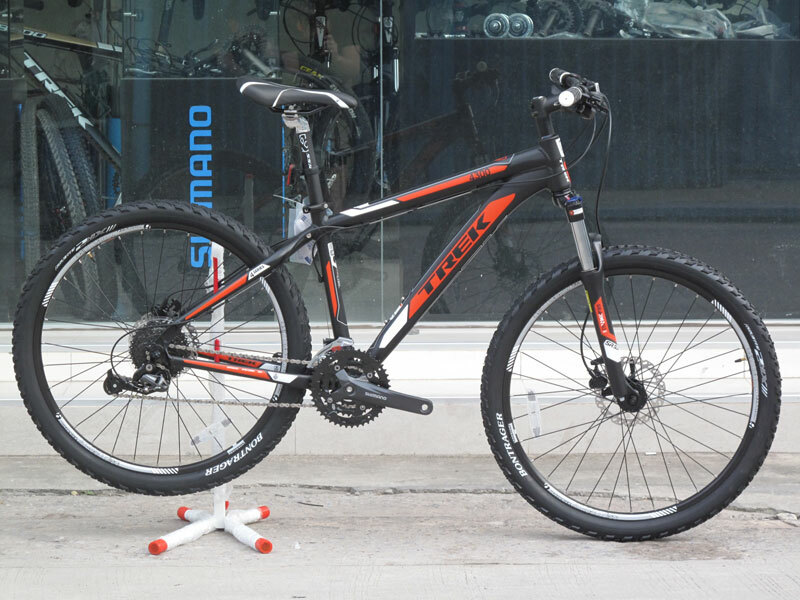 The bike normally sells for $769 but for the month of April there was a sale where the bike could be bought for $679 and they only had one 16" model left on display and weren't ordering anymore for the month, quite a few shops were doing this with this particular model. So I jumped at the chance, paid a small deposit, and put a lay-buy on it. It was lay-buyed because I still had one day until my bikes were sold. But they already had bids on them and I was gonna get the money I wanted for them anyway. I don't have the bike yet but will be picking it up in about a weeks time. 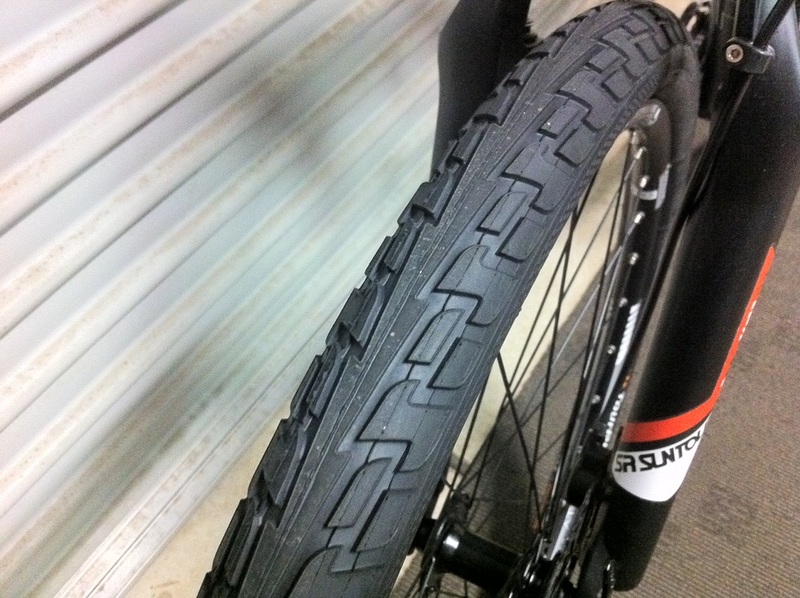 Tyres: Bontrager XR2, wire bead, 26x2.1"
Well, picked it up and got it home. Put it next to the other one just to see. 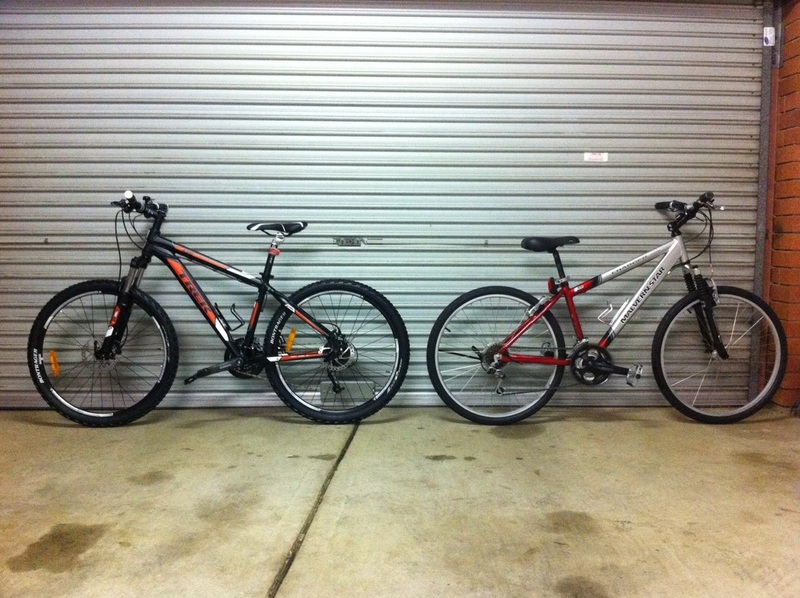 Technically they are both 41cm/16" framed bikes, but the trek handlebars seem to be positioned lower. It also has thicker rubber. 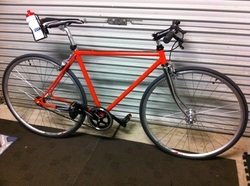 I'll be riding it to work tomorrow as my fixie currently has a damaged crank arm. It's been raining for the last week. Everything out there is muddy and messy so am looking forward to giving it a good bash in the morning. Will report back once I get to work and them back again. Well, here is my new bike. Covered in abit of mud,dirt splatter and water. It has been raining here for the last week so the roads this morning were very muddy and wet. 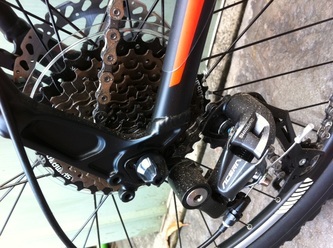 I didn't take the fixie, which is my regular commuter (lighter and faster) because it currently has a busted crank arm. Gettin' looked at tomorrow at Brown Jersey. I also kind of had no choice but to ride today as one of our cars got written off in some flood damage. As a result my wife took the car we had left to work. I didn't have any cash with me so couldn't take the bus. So I rode the only working bike I had, the new one! 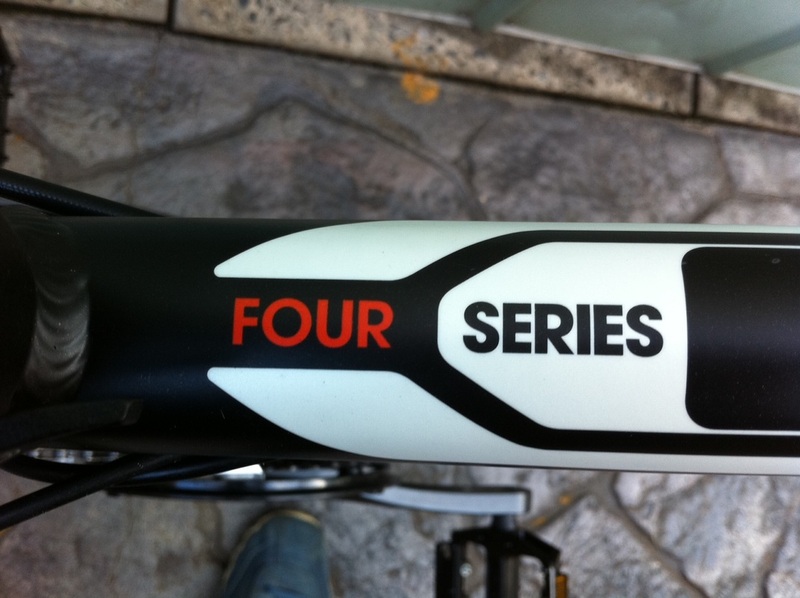 At first I was abit hesitant, but then I thought "this is a mountain bike, it's built for stufff like this!". So I took my brand new, one day old bike out for a morning bash in the messy and foggy weather! I fitted my old mudguard to it as I was certain that the knobbly tyres would chuck up alot of stuff from the ride into work. First thing I did was re-adjust the seating position so that I was comfortable. 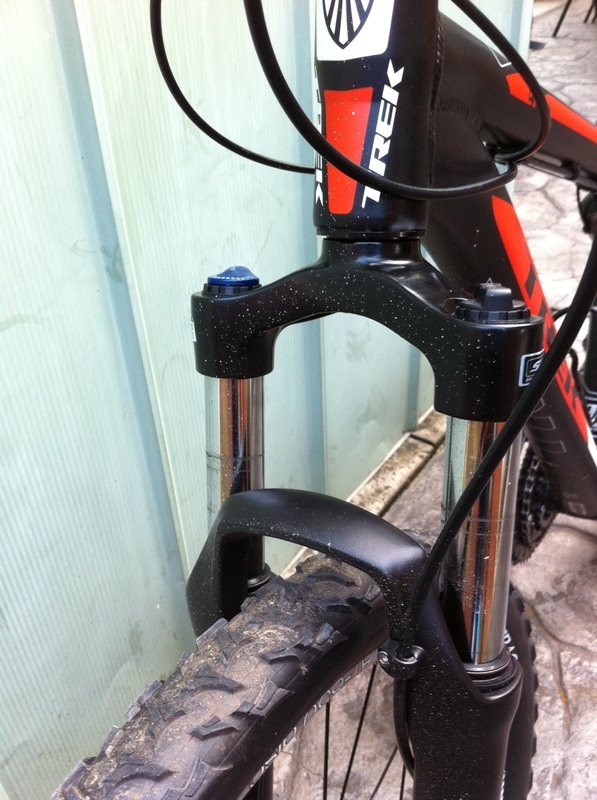 I also used the hydraulic suspension fork lockout and locked the forks so that they were nice and stiff. I was going to be riding mainly on bike paths, if the shocks are bouncing up and down whilst I'm trying to tackle a hill then there would be alot of wasted energy with me bouncing around. 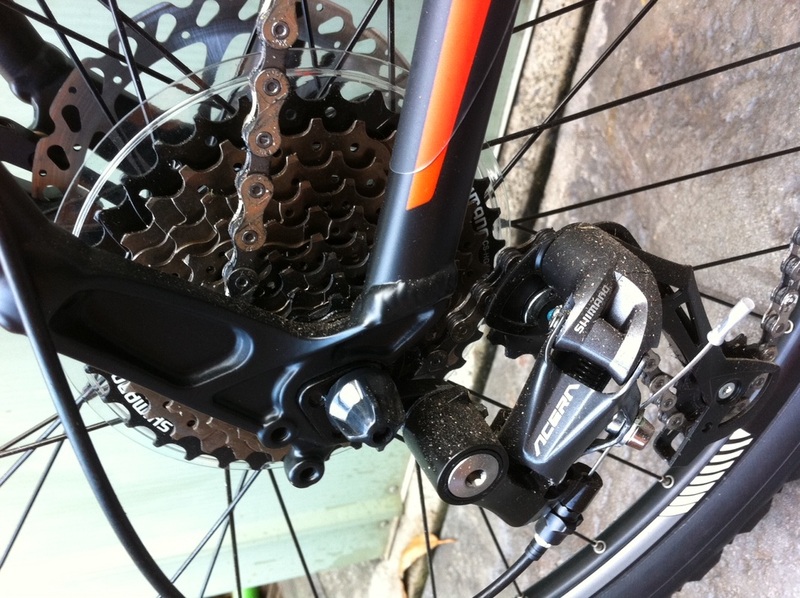 I also found that mountain bikes have smaller gearing ratios that a road bike. I am used to the road bike so found I was shifting to the bigger gears to allow me to peddle faster and pick up speed more. The knobly tyres have alot of rolling resistance compared to my fixie slicks or even the slicker tyres on my wife's mtb. So it was abit harder to peddle. The best part about the ride was not having to worry about bumps , rocks, kerbs etc. Normally in the road bike or fixie I would go around them or try to avoid any rough bits, but in this thing, it just goes right over it or I can put some downward pressure on the forks and then pull back and hop over them. Was fun! The brakes take abit of getting used to because they are hydraulic (just like a car and moves using brake fluid). 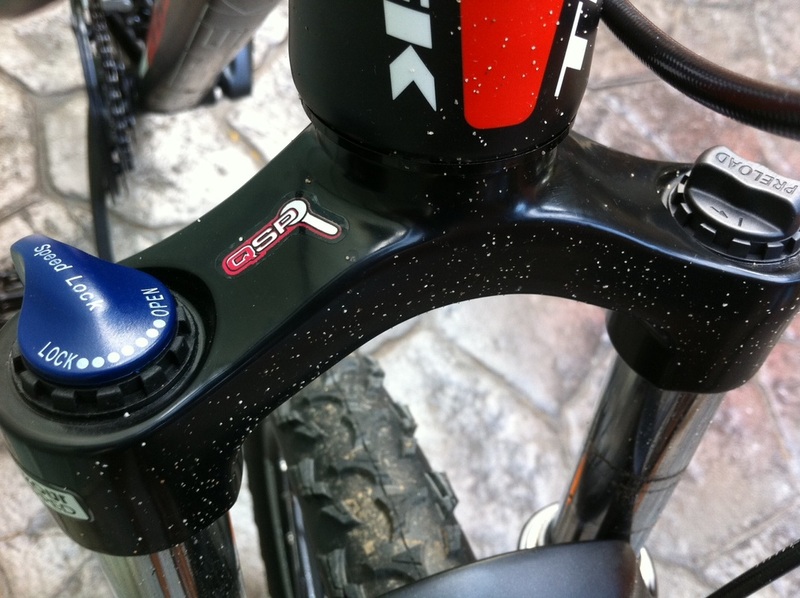 I have always used rim brakes, and discs were a learning curve. You squeeze the lever half way and it feels like nothing happens, but then when you apply more pressure, if you are not too careful you could fly right over the bars. Overall I am happy with them, but I still think for now I prefer the instant mechanical reaction you get from rim brakes. The idea is to ride with a couple of fingers feathering the brakes and even squeezing them abit ready to brake when needed. Good thing about these brakes is that stopping power is not compromised if your disc, rotors or wheel gets covered in mud, dirt or water. 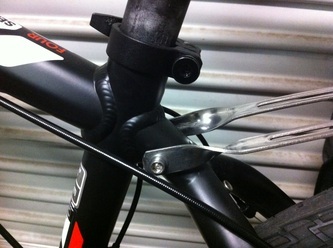 Water crossings are possible on a bike like this without the brakes getting faulty. The braking system is one of the reasons I went for this bike. 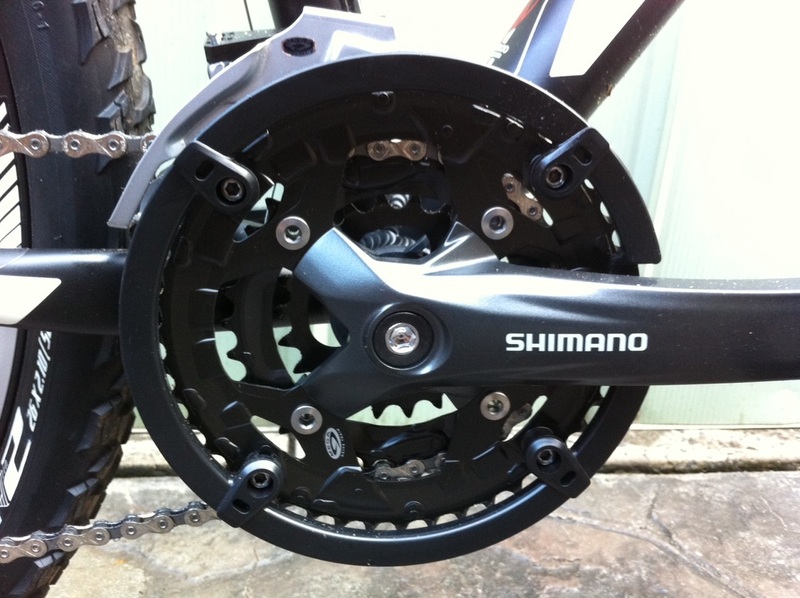 I also like the gearing system on this bike. My previous road bike had Shimano Acera shifters and I found they did the job very well. 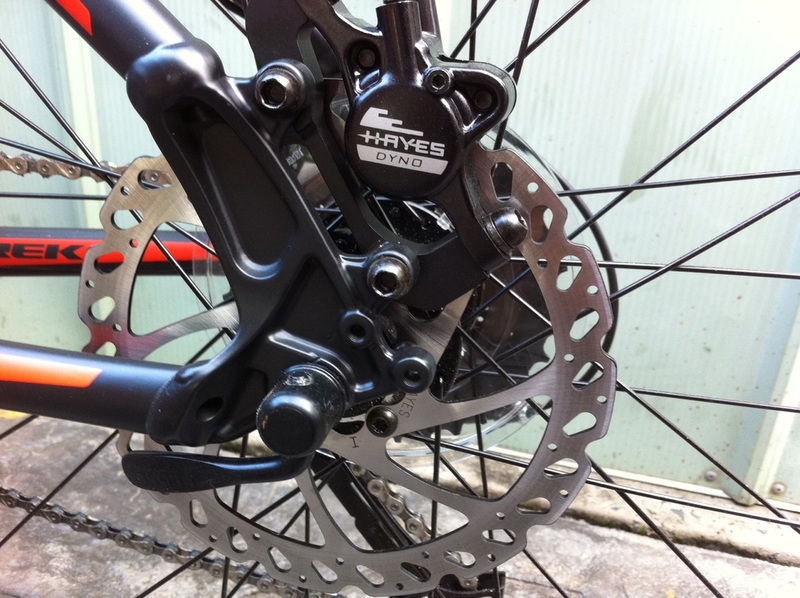 They were combined with a Shimano Sora road bike gearing system. 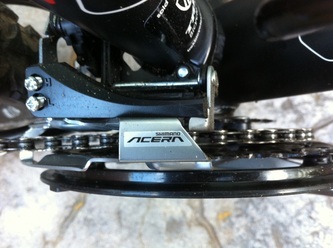 This bike is all Acera and it works well. If this was my daily ride then I would probably get another set of rims and slick tyres for it. But the fixie is my daily commuter so this won't be an issue. The only downside to this bike is the presta valves. I hate these french valves, they are so fiddly and could easily break. It also means I cannot use service station pumps (like my fixie). I'll be changing these tubes to car ones in the near future and the fixie's tubes will be changed tomorrow. Overall I think my first ride went very well and I am pleased with my purchase. I have also bought a second seatpost for it so that I can attach my sons tag along trailer to it. I don't wanna get the bikes original seatpost all scratched up. I'll be looking forward to hitting some fire trails, single stacks and dirt roads in future. Just need to find some! The Trek Transforms To A Commuter! Yep, I have decided to make this bike my all rounder. I'll always favour my single speed over anything but this bike is built tough and can pretty much handle anything. I have been on a few rides with it but nothing too tough, yet! This will now be used for almost everything. 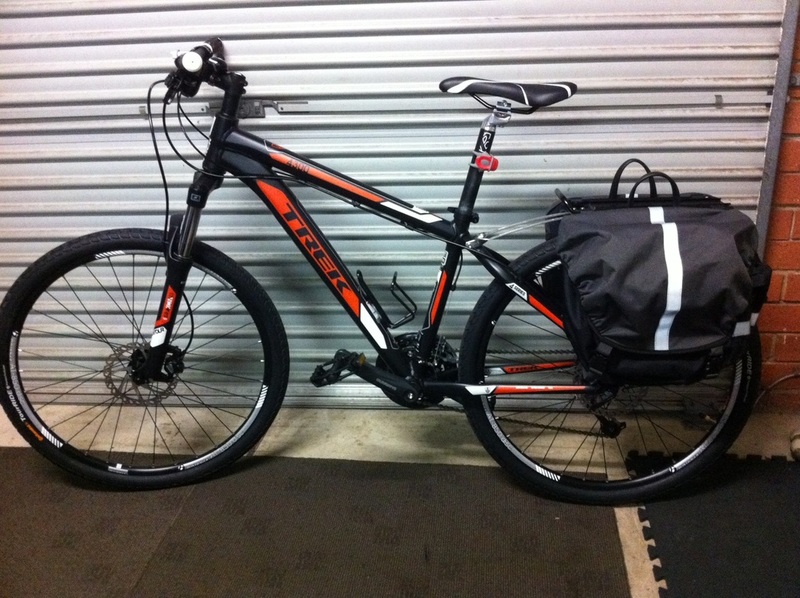 This will include going to work and back as well as errands, riding with mates, charity rides and group rides etc. It's got gears and the hydraulic disc brakes are ideal for all weather conditions. So what have I done? Well I ordered some Continental Tour Ride tyres from Wiggle online (UK). Couldn't get them here and the UK always has way better stuff. I removed the practically new Bontrager XR2 chunky 26x2.10 xc tyres in favour of a less aggressive tread with better rolling resistance. 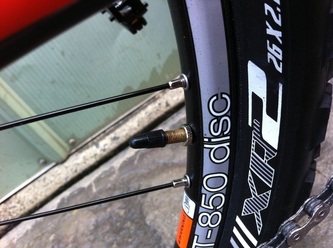 These tyres measure 26x1.75. 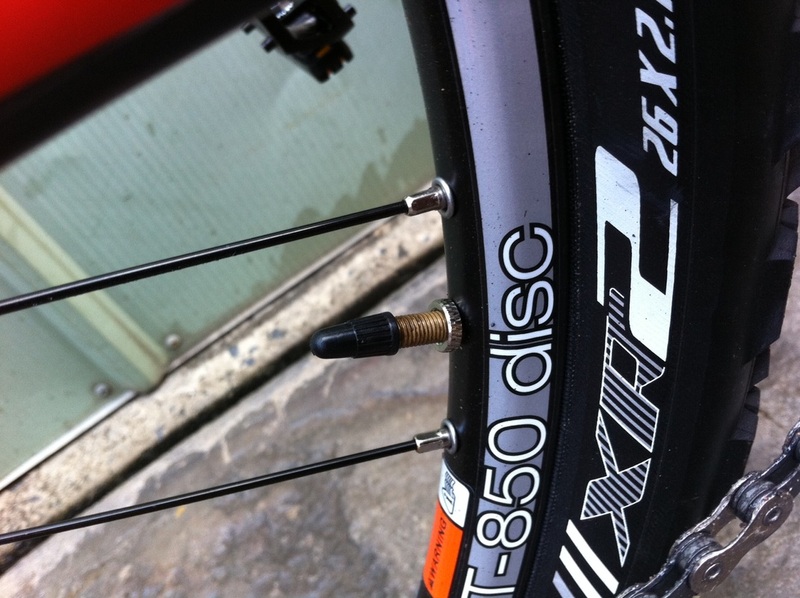 The have a slightly leaner profile and are a great all round tyre. 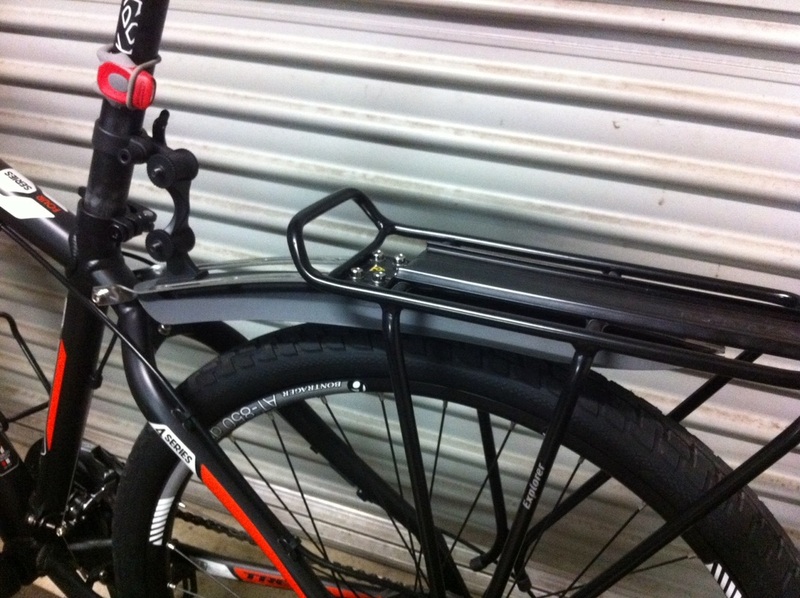 I have also attached the rear rack to the bike, took abit of fiddling but it fits fine. 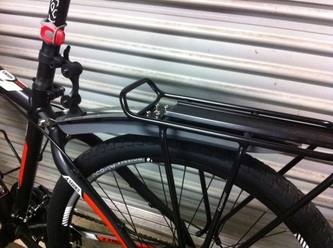 I'm not so worried about the rack and heavy bags on this bike because being a hard tail, it is a strong and sturdy frame. Plus I have the added benefit of front suspension too which will be locked out most of the time as I will mainly be on roads/paths. I'll be keeping the xc tyres for when I venture off onto the hard stuff. See the pics below for the transformation. 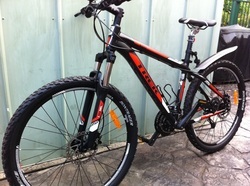 The bike rides so much better and smoother now and I am not so worried about the added weight. 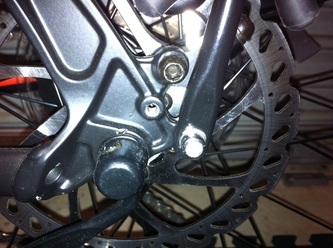 I have also added a front mudguard (spash guard really). 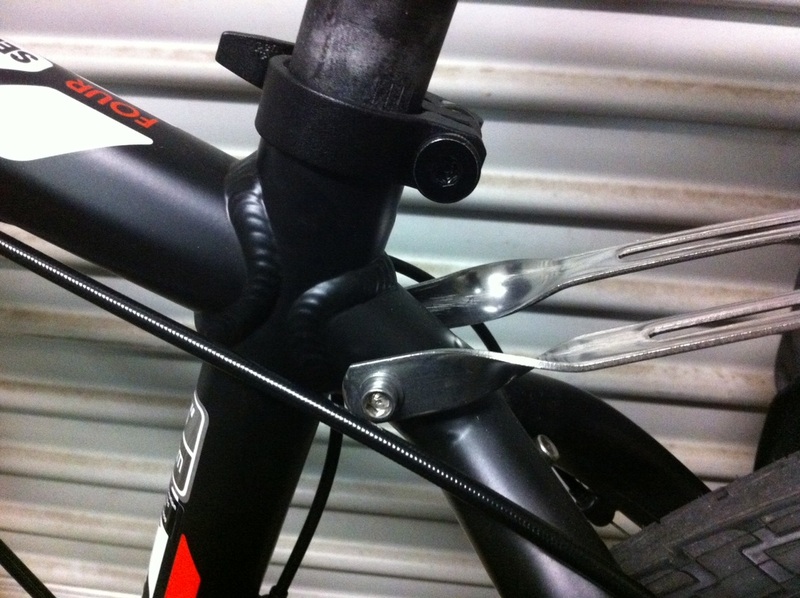 There is a nother guard that attached to the front but I found that it sits up too high, so I just use the guard mount in front to tidy up the brake cables. Works well. I have mounted my rear guard under the rack for a nice neat finish. The bike is practically a tourer now. Welcome back buddy, I missed seeing you like this! The Trek is currently for sale! I was too paranoid about taking this to work and also never really ventured off road. I have also worked out that I am a road cyclist and will never really use a mountain bike. So it is currently on ebay for auction/sale. I now have a Cannondale H300 Hybrid which I scored for free. So will be fixing that up and using it for the commute. See the page for that bike from the menu above.